Local leaders say the state could complete Corridor H by 2020 if it used a public-private partnership to finance the work. Business, community and economic development officials urged Gov. Earl Ray Tomblin and the Department of Transportation on Tuesday to implement a public-private partnership plan. They issued the call at a roadside news conference near Kerns. Recent estimates of federal funding allocations indicate Corridor H will be completed by 2036. Corridor H Authority chair Robbie Morris says that's too far in the future. 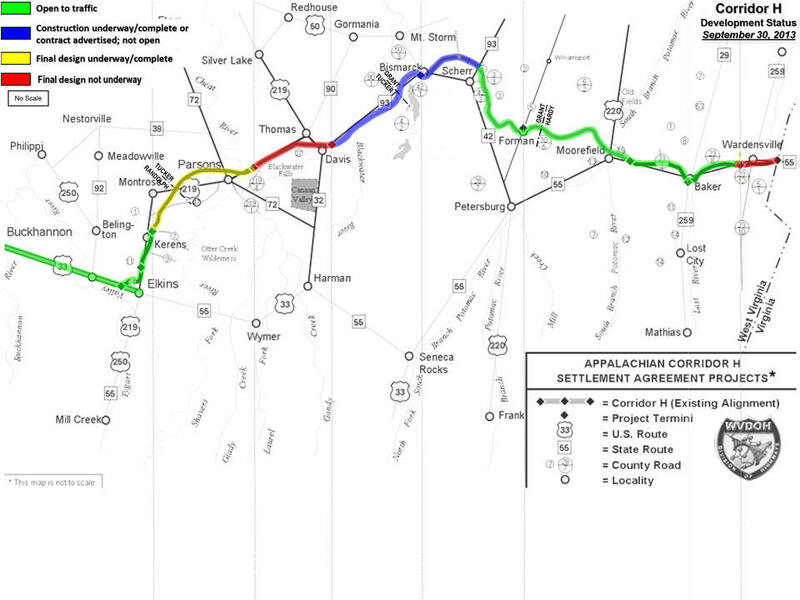 Corridor H is the only section of the Appalachian Corridor system that hasn't been finished. When it is completed, it will connect Interstate 79 near Weston with the junction of Interstates 81 and 66 in Front Royal, Virginia. Another section of Corridor H in West Virginia is expected to open by Thanksgiving. Corridor H coordinator Tommy Collins tells The Exponent Telegram that the 1.5-mile segment is near the connector to W.Va. Route 42 and W.Va. Route 93 in the Mount Storm area. Collins says another 4-mile section could open by the end of the year. But he says an early spring opening is more likely due to the weather. An economic impact study presented to lawmakers says the state would see a more than $1 billion increase in its economy if Corridor H was completed by 2020 instead of its current 2036 end date. Supporters of the accelerated plan say the money to complete the federally funded roadway is already available.